Parent Selector Column is intended to lookup to self (containing list) in order to display hierarchical data. Main difference with standard SharePoint Lookup is absence of own item (standard SharePoint Lookup contains own item). Users can also use the picker dialog to choose data from large lists. You can easily convert exising standard Lookup column to "ArtfulBits Parent Selector" column and use data filtering, picker dialog, and other features. 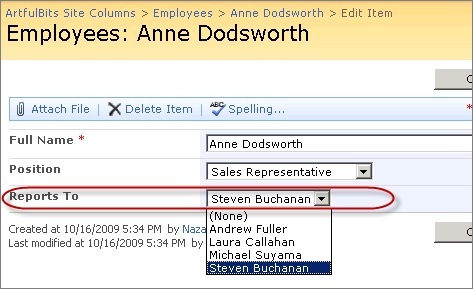 Parent Selector Column can organize hierarchical relations in SharePoint list. If you have hierarchical data in a list and you need to lookup data in own list (containing list), using ArtfulBits Parent Selector column is the best choice. Qweas is providing links to Parent Selector Column 1.7 as a courtesy, and makes no representations regarding Parent Selector Column or any other applications or any information related thereto. Any questions, complaints or claims regarding this application Parent Selector Column 1.7 must be directed to the appropriate software vendor. You may click the publisher link of Parent Selector Column on the top of this page to get more details about the vendor.